These large Day of the Dead Picado Banners are perfect for your Dia de los Muertos display and celebration. 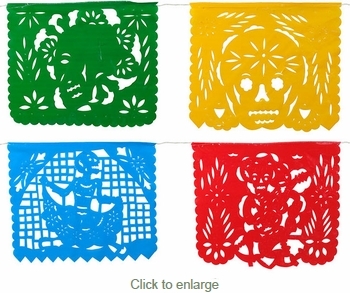 There are 10 Day of the Dead design cut-outs in vibrant colors. These durable plastic banners can last for many years with the right care. Sold in sets of 2 banners. Use the quantity box for the number of sets of 2 you would like to order. The 10 picados are connected with twine that is approx. 17 ft. long.